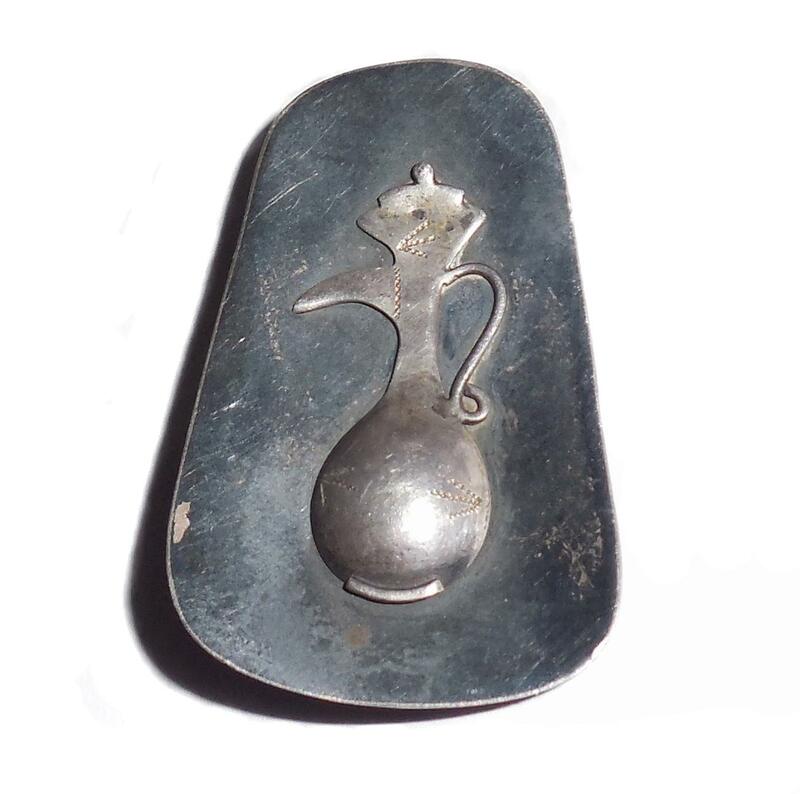 This is an early 1950s vintage mid century Israel sterling silver pendant pin with a judaica ewer that has 3 hand chased arrows on it. Marked Israel Silver. Tested and Guaranteed sterling quality. The ewer is hand applied and hand riveted the old way using very, very tiny rivets top and bottom onto the back. It has some surface age wear but no dents or dings or tears or deep scratches. From an estate, completely original condition. No repair or alteration of any kind. The actual pendant looks Much Better than the photo as the camera flash accents light scratches many of which are not eye obvious. Having a large oblong mid century form this is a lovely early judaica pin for your vintage collection. Size is 1 13/16" tall by 1 3/16" wide across the center. 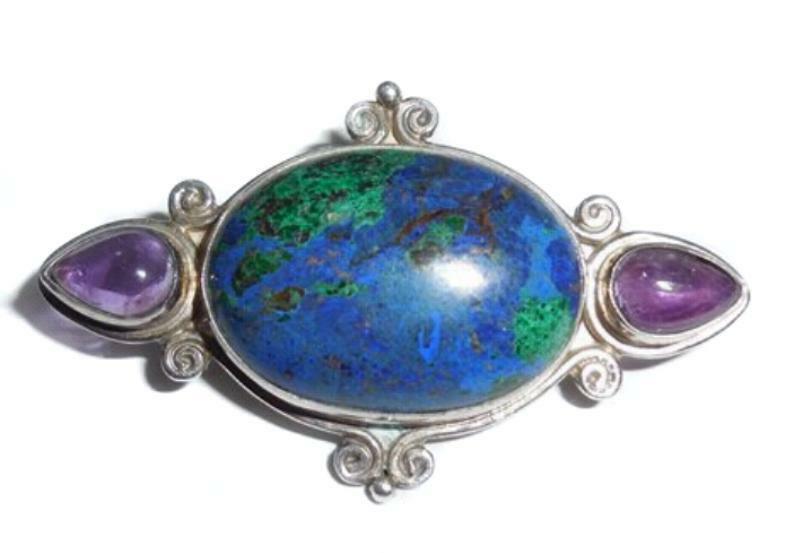 This is a vintage 1990s Sajen Sterling Silver Large Azurite Amethyst Pendant Pin that is hand crafted and very well made. It is marked Sajen, Sterling. The center hold a gorgeous and very large natural mined azureite cabochon. Additionally, there are 2 amethyst teardrop cab stones at the ends. One of the amethysts has age wear and some inclusions that you can see in the enlarged photos. This is not eye obvious when the pendant is worn dangling on a necklace chain. Other than this, it is in excellent condition. No dents or dings or tears or deep scratches. No repair or alteration of any kind. Size is just about 2" long by 1 3/16" wide across the center. Just add a chain and you will have a beautiful colorful gemstone necklace by well known jewelry artisans for your collection. OR, use on any lapel and it looks lovely! 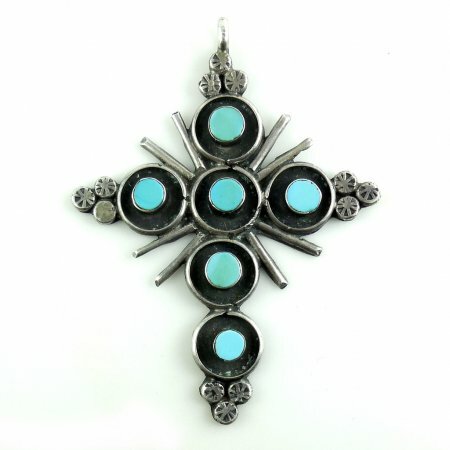 This is a large stunning vintage hand wrought sterling silver and turquoise cross pendant. Mens or womens. Hand made Native American or Southwestern artist. It is beautifully made with good crafting and fine quality workmanship. All of the ends are hand tooled and the center rays are hand applied. It measures 3 1/8" tall by 2 3/8" wide. Weight is 18.1 grams. The turquoise is bezel set and one has a very old age hairline, hardly noticeable. Other than this, the condition is excellent, gently used. It has a strong bale with a 4mm opening to hold a larger mens chain if needed. Just add your chain and you will have a stunning showy Native American or Southwestern sterling cross necklace. It is highly noticeable even at a distance. 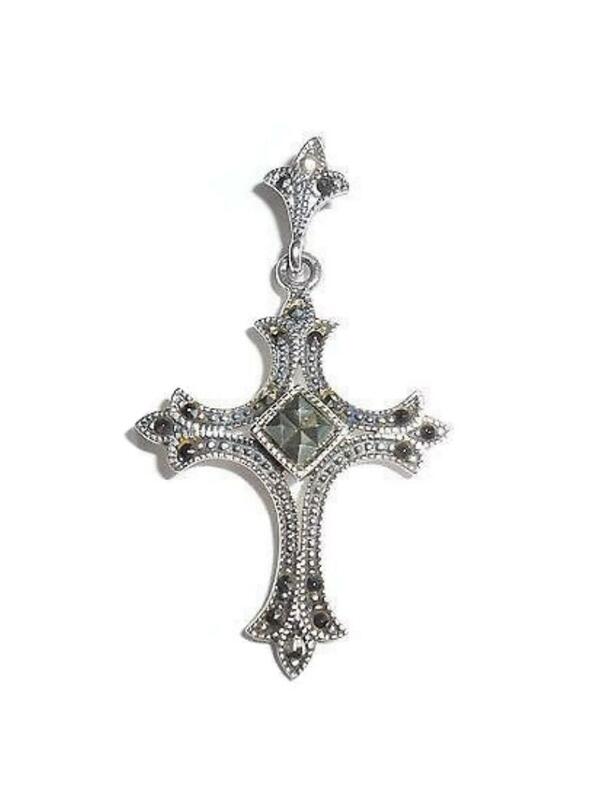 Fancy vintage Sterling Silver and marcasite cross pendant with a fancy matching bale. Marked 925 and guaranteed to be solid sterling silver. Detail: Old beaded edges and fleur de lis wraps on each arm. Excellent condition. No damage or repair. Light age wear only. Size is 1 7/8" tall with the bale North to South by 1 1/8" wide across the arms East to West. Lovely piece for your vintage silver jewelry collection. This is a gorgeous 1980s vintage fancy sterling silver cross pendant with showy millgrain edges and faceted marcasites and a matching bale. It is marked 925, tested and Guaranteed to be solid sterling silver. Size is 1 7/8" tall from top of bale to bottom by 1 1/16" wide across. 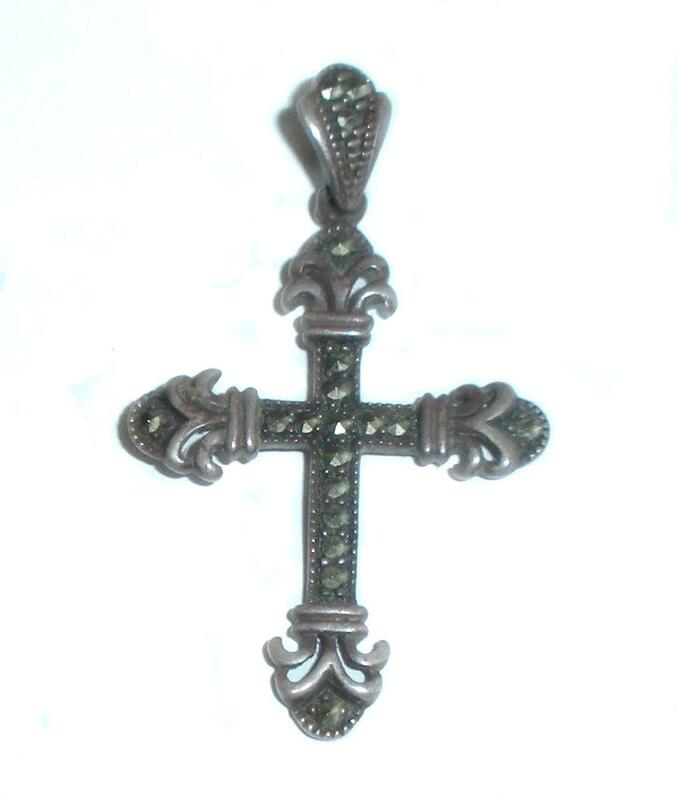 In excellent condition this is a beautiful fancy delicate cross pendant for your collection. 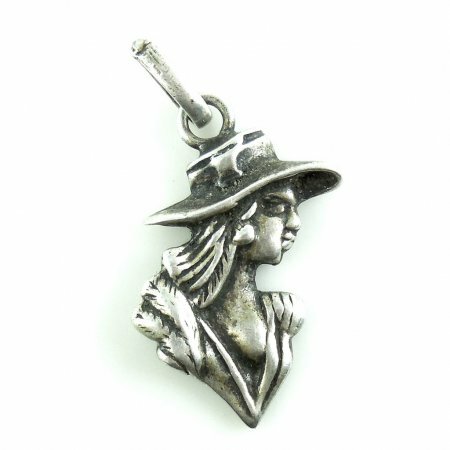 This is a vintage sterling silver Southwestern pioneer or Latin lady face pendant. She has a very high level of detail. Size is 1 13/16" North to South without the bale by 3/4" wide across the hat brim. Condition is excellent. Just add a chain and you will have a lovely unusual vintage lady head necklace or use it on a charm bracelet. 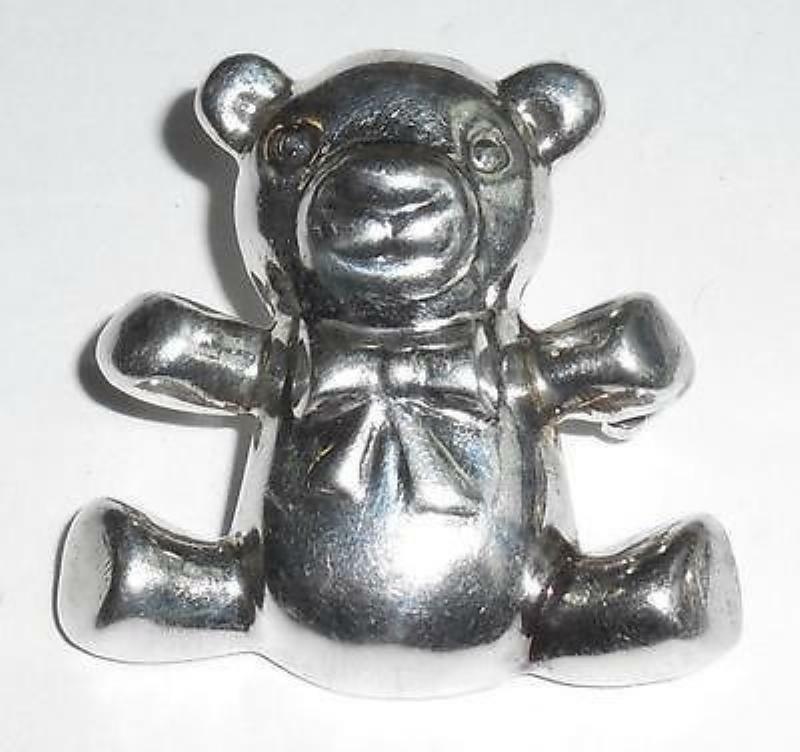 This is a very cute vintage 1980s sterling silver pendant or pin of a puffy teddy bear. It is marked 925 tested and Guaranteed to be solid sterling silver. The front is puffy. The back is flat. It is well made with a thick, hand applied, partially hidden bale and a thick, strong C clasp. Excellent Condition. Size is 1 1/4" tall North to South by 1 1/8" wide across the center arms. Weight is 6.6 grams. Lovely item for anyone who collects or displays vintage teddy bears! 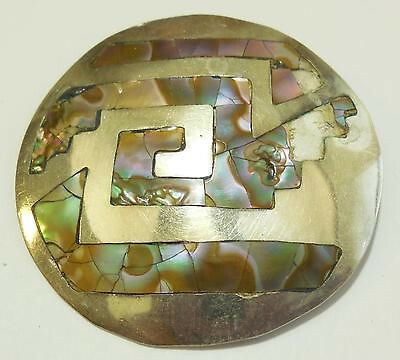 This is a vintage Hand Made Taxco Mexican Sterling Silver pendant pin with abalone pearl inlay for repurpose, repair, restore. Marked ACC inside a circle, Mexico, Sterling, or 925 Taxco. The front has a carved Art Deco style geometric pattern with deeper recessed areas of pearl inlay. Size is 1 7/8" across in diameter. Weight is 9.5 grams. Add some abalone pearl inlay and you will have a lovely vintage Mexican statement piece for your collection. This is a vintage 1990s modernist hand made Taxco, Mexican sterling silver turquoise dangling heart pendant. 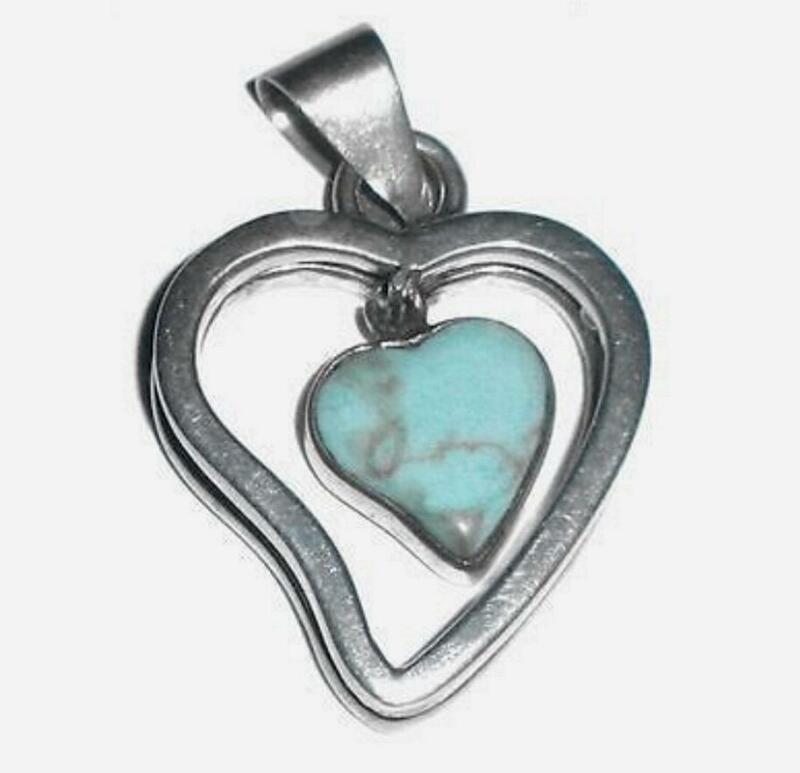 The inside carved turquoise heart dangles within the larger heart. It is marked TA-215, 925, tested and guaranteed to be solid sterling silver. It is beautifully made of very substantial, thick sterling silver. Size is 1 3/4" from top to bottom including the bale by 1" wide across by 1/4" deep. This is a beautiful modernist statement heart for your collection. 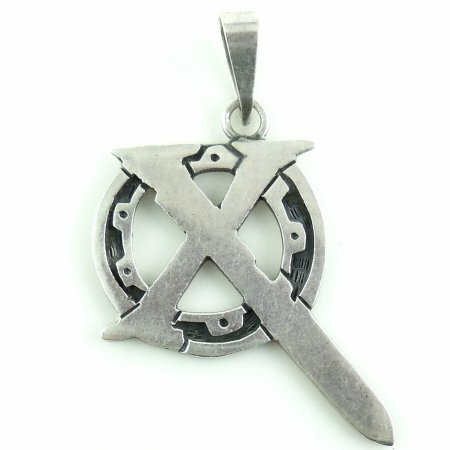 In excellent condition this is an original, rare, hard to find Xena Warrior Princess Chakram X sterling silver pendant. Marked Xena WP Studios, Sterling, USA. Size is 2" tall, North to South from top of bale to bottom tip of sword. Width is 1 1/8" across the center of the circle. Just add a silver chain and you will have a beautiful Xena necklace for your collection. 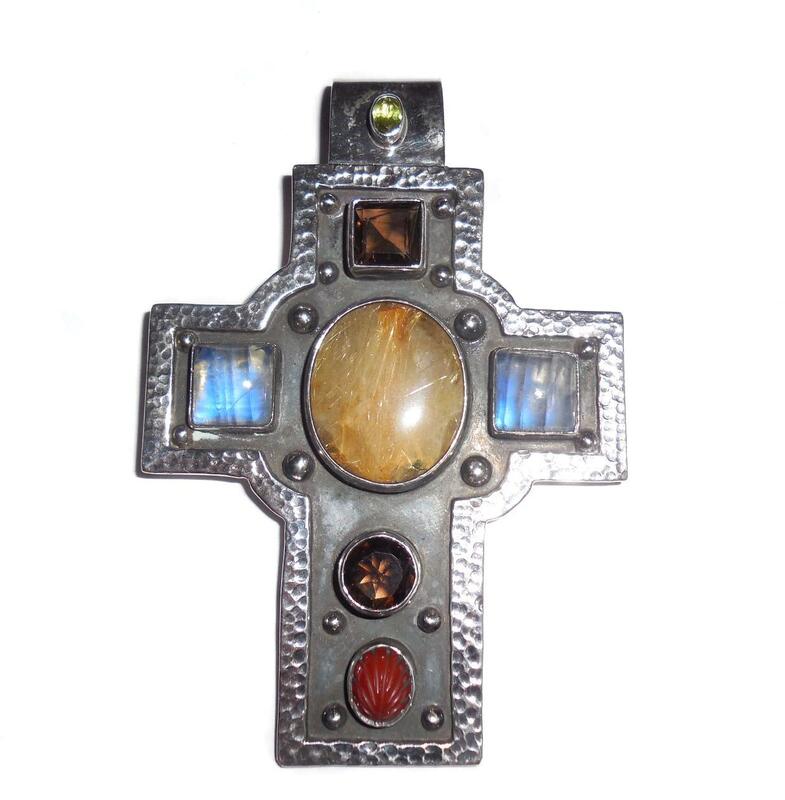 XL Chris Bales Elligators Sterling Silver Gem Cross Retired and Hard to Find Mens or Womens Metal: Solid Sterling Silver Weight: 57.6 grams Gemstones: Rutilate Quartz, Smoky Quartz, Peridot, Carved Carnelian, Laboradorite Size: Almost 4" tall north to south by 2.62 inches wide across the arms east to west Condition: Excellent, used. Please read full product description below and feel free to use the contact us link at the top of the page if you have questions.